In late 2014, I noticed that there were a tremendous amount of ads on public transit in Atlanta encouraging people to vaccinate their kids with HPV vaccines. I ride public transit and the public transit system in Atlanta has a 70 to 80 percent Black ridership so obviously these ads were designed to target Blacks in the city. Here is a picture of this CDC-funded advertising campaign. What the CDC did not disclose in these ads is that HPV vaccines are very dangerous, genetically engineered, anti-fertility vaccines being given to Black and Brown people all throughout the world to sterilize and kill them off for eugenics/population control purposes. Here is why I state the purposes of these vaccines is eugenics and not public health. 1. 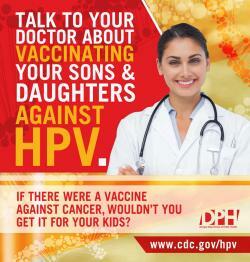 HPV vaccines do not prevent cervical cancer but actually cause the disease. 3. Cervical cancer usually occurs in women in the 60s so why is the CDC promoting a vaccine to young girls for a disease that they get when they are 60? 4. As documented in my previous article, HPV vaccines sterilize boys and suppress their ability to produce testosterone which means no testesterone, no sperm! 4. HPV vaccines contain additives which cause infertility and spontaneous abortions. 5. Girls, unlike older women, have the ability to be fertile so if you wanted to sterilize women particularly Black women, it is best to do it when they are young. 6. HPV vaccines have killed close to 47 girls already. Al Jazeera in 2011 documented how a clinical trial was done on young girls in India and how several of them died after receiving the vaccine. The vaccine trial was sponsored by the Bill Gates Foundation. The Indian government has condemned the foundation for their involvement in this barbaric, obvious population control effort. 7. Bill Gates is a population control eugenicist who openly stated that he wanted to use vaccines to kill off the world's population. His foundation is currently spending billions on providing HPV vaccines to Black and Brown people all throughout the world for eugenics purposes. 8. There have been numerous anti-fertility vaccines which have been intentionally released in places like Kenya where 2 million people were sterilized. Anti-fertility vaccines have existed and been used since the 1970s. 9. I have documented in an hour long radio show that HPV vaccines are in fact, eugenics vaccines used for population control. 10. HPV vaccines have recently been banned by the Japanese government for concerns that it causes infertility. Based on the evidence above, the CDC's promotion of HPV vaccines has nothing to do with public health but with promoting eugenics or scientific racism which is still alive and well in America today. The eugenics movement started in America and later spread to Nazi Germany. Here in America, thousands of Blacks were forcibly sterilized or were intentionally killed through inhumane medical experimentation like the Tuskegee experiment which the CDC was involved with! In the late 90s, the CDC was involved in an experiment where Blacks babies in South Central were used as guinea pigs and then killed to test a deadly vaccine. Recently, in 2014, a CDC whistleblower documented how the agency deliberately withheld data which showed a 240 percent in autism in Black boys from the the MMR vaccine. As a result of this information being suppressed, 100,000 to 250,000 Black boys have autism who otherwise would not. The agency also promoted a tetanus shot which was given to Blacks in Kenya in 2014 and ended up sterilizing close to 2 million people! Now, the agency is promoting genetically modified, anti-fertility vaccines to Blacks? This is genocide, eugenics, and scientific racism at the high levels. The fact that HPV vaccines are population control/eugenic vaccines make it even more scarier now that state governments are already started mandating them. Plus, the CDC wants to dramatically increase the vaccination compliance rate for these worthless, extremely toxic vaccines to 80 percent adherence by 2020. How will this be done? This will be done through HPV vaccine mandates throughout America which amounts to forcible sterilization! Recently, I helped organize a rally in front of the CDC to protest the corruption within the agency and how they are working for Big Pharma to kill and maim our babies. Hundreds of people showed up at this rally. Later, we had a rally at Grant Park to bring attention to the dangers of vaccines, medical fascism, the allegations of the CDC whistleblower, and the corruption within the agency. The rally featured Barbara Lou Fisher of the National Vaccine Information Center, Eric Gladen, Dr. Toni Bark, Ron Cummings of the Organic Consumers Association, Lynn Redwood, Marcella Piper Terry of www.vaxtruth.org, Robert F. Kennedy Jr, and Minister Tony Muhammed. It was an awesome rally and this rally is the start of a broad and multi-ethnic vaccine movement. You can learn more by visiting www.cdctruth.org. You can also donate to this movement by clicking here to further advance it.